Homeowners often overlook the negative impacts that old windows and entry doors might be having on their homes. Windows and doors that stick or let drafts in are more than a nuisance - they can actually cost you money on your utilities. Furthermore, worn-looking windows or doors can decrease your home's value and appeal. Great Lakes Home Renovation's trained professionals can properly install beautiful replacement windows and doors around your home. Our products come in a variety of colors and styles, so you'll be sure to find the right fit for your home! To get started on your window and door needs, call Great Lakes Home Renovations today! We offer free estimates on all of our services throughout Greater Twin Cities Area. When is it time to replace your windows or doors? Over time, lots of things can go wrong with your home's original features. If you've noticed any of these issues with your windows or doors, you might want to consider replacements. If you have these issues with your windows or doors, you may want to consider replacements. Peeling or chipping paint: Peeled paint not only looks bad, but it can also betray the old age of your windows and doors. Have them inspected to see if replacements are in order. Excessive noise outside: If you think you can hear too much of what's going on outside your home, improperly fitted or low quality windows and doors might be to blame. Damaged seal or caulking: The caulking or seals around your windows and doors are crucial for maintaining comfort and energy efficiency - if they're damaged or broken, replacements are usually needed. Difficult to open or close: Windows and doors that stick aren't fitting in their frames properly and can cause energy loss and safety issues. Drafts coming from around windows and entry doors: Drafts signal energy loss in your home. New windows and doors make your home more insulated and your heating and cooling system more efficient, saving you money. Condensation on glass pane: This is another potential sign of energy loss when heated air escapes and condensates on the colder window surfaces. Hard to clean: If your windows and doors are made from a material that's hard to clean, they can give your home a shabby appearance - upgrading to a newer product will eliminate this concern. If you choose the wrong contractor to install your windows or doors, many of the problems listed above will likely recur. These products need to be fitted exactly, or moisture, noise and energy problems will continue to plague your home. Great Lakes Home Renovation's technicians are fully trained and certified to carry out the work needed. We can offer the best variety of high-quality windows and doors to complete your home. The experts at Great Lakes Home Renovations are ready to give you beautiful, effective replacement windows and doors that will look great for years to come. Call us today to get started with a free estimate in Minneapolis, Saint Paul, Apple Valley, Burnsville, Eden Prairie, Lakeville, Andover, Osseo, Mankato, Hopkins and the surrounding areas! 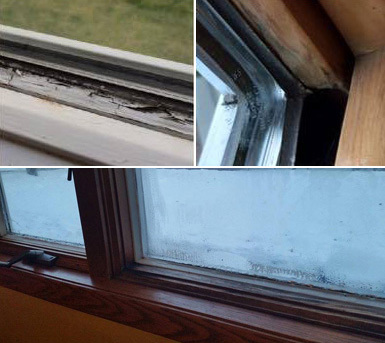 Before and After of a window replaced in Lakeville. The before is an old wood 3 pane window with crank-outs...that didn't crank out anymore. The new slider window creates a much larger feeling window with so much more viewing area. The new window will be warmer, more energy-efficient, easier to operate and beautiful forever. Before and After of a Patio Door replacement in Lakeville. Sometimes we have a "hunch" there is rotten wood around windows or doors. Once the old wood is removed we can see clearly what we are dealing with. A new vinyl patio door installed properly can ensure this problem won't happen again. A cracked window isn't just unsightly, it isn't insulated. Once a pane of glass cracks on a double hung window, all of the insulating gas escapes and your window is no longer insulated. Once a window reaches a point, the best solution is to replace the entire window rather than just fix the glass. Many patio doors and windows we replace have glass that is "foggy." That foggy glass means that the seal of the window has failed. Seal failure isn't just an unsightly problem, it means that the glass is no longer insulated. Once a seal fails, all of the insulating gas will escape leaving nothing between your home and the outside but two panes of glass. This is no longer energy efficient. You can see in this before and after they have a much better view of outside and they will have a much warmer area near the new sliding patio door. 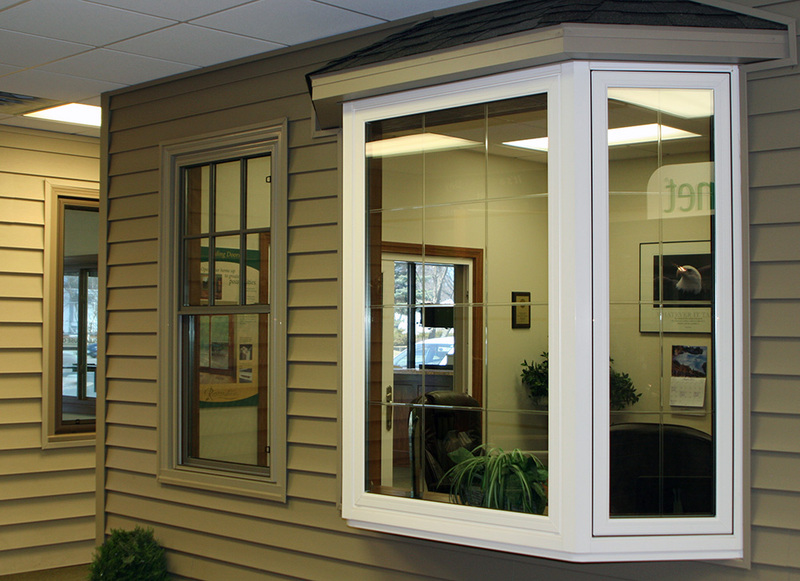 Our 3-lite slider windows give any room a nice open look and feel. The 3-lite slider has such a slim profile, that the frame does not clutter the viewing area. As you can see in this before and after set, the new window has a much clearer view outside. The seals had failed on the original window clouding up the glass and making the window no longer insulated. The new window is not just an improvement to the look, but a huge improvement to energy-efficiency and comfort. When you trust us with your window and door needs, Great Lakes Home Renovations can offer all of the following solutions and more! We know that no two homes will have the exact same window and doors needs. We offer a variety of solutions, including different materials and styles, to ensure you love the end result. Great first impression. Replacement bay window. Our quality vinyl windows and doors come in different colors and are easy to maintain year after year. 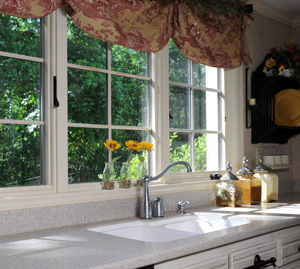 We also offer double-hung and casement windows when appropriate for your home. Finally, we specialize in different types of doors depending on where they're situated in your home - you wouldn't want a patio door to be the exact same as an entry door! Great Lakes Home Renovations can offer all of these solutions and more when you trust us with your window and door needs. If you choose the wrong contractor to install your windows or doors, many of the problems listed above will likely recur. These products need to be fitted exactly, or moisture, noise and energy problems will continue to plague your home. Great Lakes Home Renovations technicians are fully trained and certified to carry out work needed. We can offer the best variety of high-quality windows and doors to complete your home.